Riyadh -- US President Bush on Tuesday nudged OPEC powerhouse Saudi Arabia and other cartel members to produce more oil, recognizing that soaring prices are straining the US economy. Bush said he is speaking with Saudi King Abdullah, whose nation holds the world's largest oil reserves, about the situation that has seen the per-barrel price briefly top US$100 this month and US pump prices jump past US$3 a gallon. "Oil prices are very high, which is tough on our economy," Bush said. "I would hope, as OPEC considers different production levels, that they understand that if ... one of their biggest consumers' economy suffers, it will mean less purchases, less oil and gas sold." The Organization of Petroleum Exporting Countries next meets Feb. 1 in Vienna, Austria, to consider increasing output. Bush spoke before a discussion at the US Embassy with Saudi entrepreneurs. While the president stuck to his schedule, Secretary of State Condoleezza Rice slipped away from the Saudi capital for an unannounced visit to Baghdad for talks with Prime Minister Nouri al-Maliki. One of his aides said Rice encouraged the prime minister to speed progress of legislation on provincial elections, constitutional amendments and a law to share oil and gas resources among the different sects. Rice was en route to the Iraqi capital when the White House informed reporters traveling with the president. There was speculation before Bush left Washington last week on his eight-day Mideast trip that he would be the one to stop in Iraq. Oil prices also came up during other stops on Bush's trip, largely in the context of his push for alternate fuels and sources of energy. White House counselor Ed Gillespie said Mideast leaders have talked to Bush about "the vast demand that's on the world market today for oil." He said that was "a legitimate and accurate point." In the US, high costs for fueling cars and heating homes are leaving people with less money to spend elsewhere, and prices for some other goods and services also have risen. OPEC oil accounts for about 40 percent of the world's needs, and OPEC ministers often follow the lead of the Saudis when discussing whether to increase production to take the pressure off rising prices. The Saudis' views carry great weight because Saudi Arabia is responsible for almost one-third of the cartel's total output. 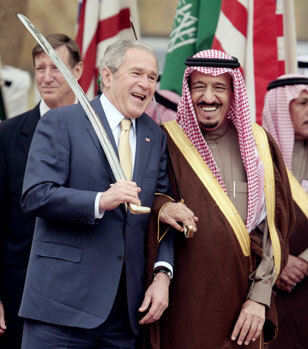 Bush spoke before meeting with Saudi business owners, many of them young and educated in the United States. The group included two women. Bush appealed to one of Saudi Arabia's biggest complaints when he acknowledged the tight visa restrictions his administration set after Sept. 11, 2001, on Saudis trying to visit the US. The kingdom was the homeland of 15 of the 19 hijackers involved in the terrorist attacks.